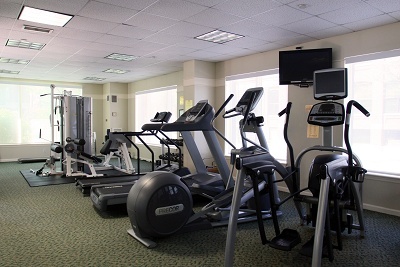 Residents are able to enjoy the added luxury of River Court's Health Club. The Health Club is complete with state of the art Tuff Stuff Apollo 5 four stack multi-gym, treadmills, stairmasters, stationary and recumbent bikes, a rowing machine, free weights, and an elliptical trainer. There is also room for weight training, stretching, pilates, and yoga as well as a TV to watch while working out. In fact, many residents have their personal trainers come to River Court for their training sessions. The gym is located off the main lobby and is open daily 5:30am - 12 Midnight. For everyone's use and enjoyment, we ask that you follow the rules and regulations for use of the Health Club. For safely reasons, children under the age of twelve must be accompanied by an adult in order to use the Health Club.